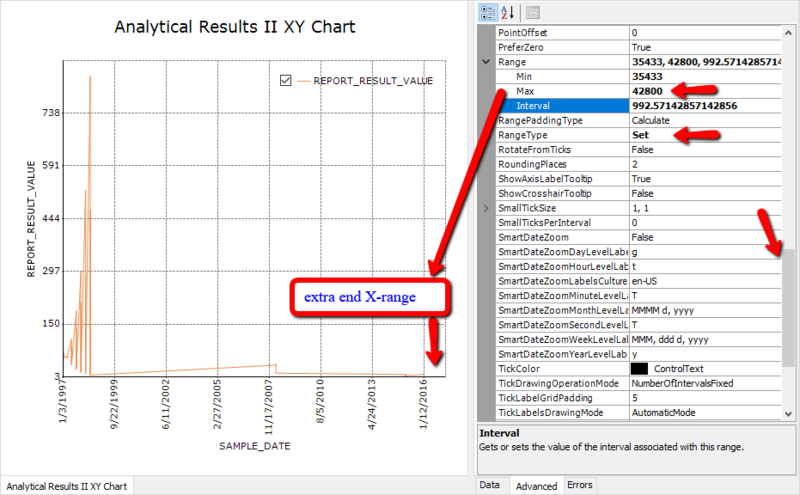 The maximum and minimum values for X and Y axis scale bar can be set in the XY Chart. 1.Run ARII with some parameters selected and open XY Charts. Click Add Series to generate a chart with default parameters whose X-Axis Scale>Scale (or Y-Axis Scale>Scale) defaults to relative. Note: The X (or Y)-Axis range is automatically calculated based on the charting data. 2.Click Clear Series, set X-Axis Scale>Scale and/or Y-Axis Scale>Scale as absolute. Click Add Series to generate the chart. Note: The max and min of the X (or Y)-Axis range are calculated based on and applied to all charts, if multiple charts are created (to be used where multiple charts need to be reviewed under the same X and/or Y scales). 1.Click on the Advanced tab. 2.Click anywhere below the X-axis. 3.Scroll down through the properties of Advanced tab, find and expand Range to adjust Min/Max/Interval. For example, Max is changed from 42381 to 42800 and an extra ending X-range is added in the chart (see Figure 1). Note: The RangeType is Set when X-Axis Scale>Scale (or Y-Axis Scale>Scale) is selected as absolute. Changing RangeType from Set to Auto will switch the chart back to a range similar to the default relative range.